This is a very grown-up cake, but in the best possible way. It’s sweetened with maple syrup and flavoured with just a little rosemary and thyme which makes it lovely and fragrant. I made this cake on Wednesday, then another on Thursday – it’s that good. 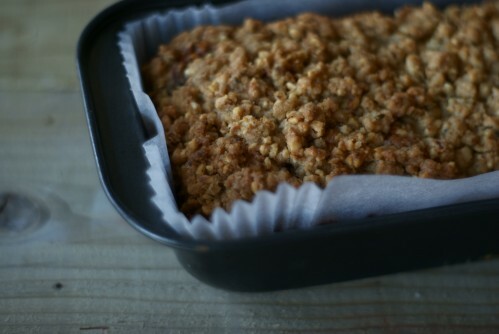 The streusel topping? It’s basically a nutty crumble sprinkled on top of the cake – you can’t go wrong really. I’ve got tonnes of blueberries stashed in my freezer, so I’m been using them up with this recipe, but you could definitely use blackberries instead, preferably foraged from a hedgerow. Preheat the oven to 180C. Line a loaf tin with greaseproof paper. Put all the topping ingredients into a food processor and pulse until starts to look knobbly and almost comes together as a dough. Mix the flour, oats, baking powder, bicarbonate of soda and salt together in a bowl. Beat the butter and sugar together in a bowl until light and fluffy; slowly beat in the maple syrup until smooth. (Don’t worry if the mixture starts to curdle). Beat in the egg, then the vanilla, yoghurt and herbs. Fold in the flour mixture until smooth then stir in the blueberries. Spoon the cake mixture into the loaf tin and spread smooth. Sprinkle over the topping and bake in the oven for 45-50 minutes, or until cooked through. Yum, that looks delicious! 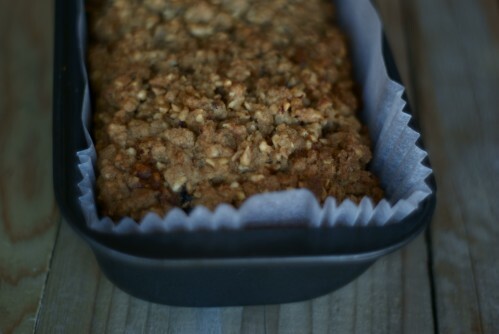 I absolutely love streusel cake and blueberries, so together they sounds like a winning combination! You mentioned oats in the method but there are none in the ingredients part. Was this just a typo or did you miss them out. Please send me a response as I would like to make this, it sounds really good and I have a big bag of blueberries in my freezer. Sorry about that, I missed the oats from the ingredients. I’ve added them in now. Hi, this recipe sounds right up my street. Please could you confirm if this recipe requires a 1lb or 2 lb loaf tin?